Luckily for us, there have been an unusual amount of Audi spy shots lately. 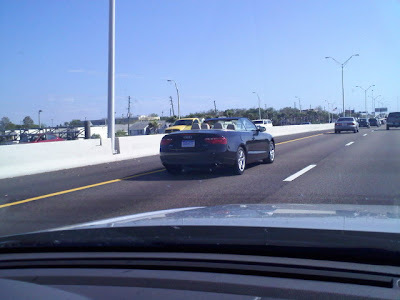 The latest is this 2010 Audi A5 2.0T Cabriolet spied in Florida. Following the car's Geneva debut, final testing is underway here in North America. 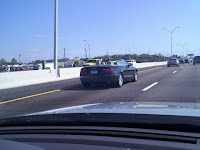 Spotted by Audi World forum member, "Love_My_A5" this A5 cab was cruising somewhere between Tampa and Sarasota, Florida. 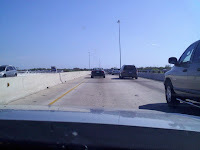 Apparently the photographer was able to yell over to the driver expressing his admiration. 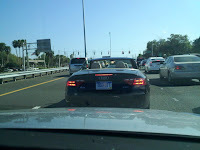 The driver responded with, "Car is not out yet and there is an Audi test facility nearby". The driver also confirmed the car was an automatic. 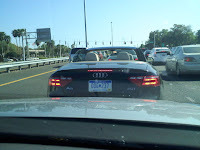 Details regarding the US A5 cabriolet's powerplant are still sketchy. We do know that the Euro-spec A5 range will include a 160-horsepower 1.8 TSI; two 2.0 TFSI's (180 jp and 211 hp); the 265 hp 3.2 FSI V6; a 240 hp 3.0 TDI; and a 190 hp 2.7 TDI. The S5 gets the new, supercharged, 333 horsepower 3.0 V6.